Since 1995, the Mike Morse Law Firm has been protecting the rights of Michigan auto accident and injury victims. The Mike Morse Law Firm offers innovative and aggressive legal representation for people injured in auto, truck and motorcycle accidents, as well as social security disability cases. To date, settlements and verdicts for our clients exceed $734 million dollars. 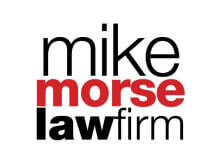 The Mike Morse Law Firm is Michigan’s largest personal injury firm law with over 149 employees and 52 lawyers. Cases are handled throughout the state with headquarters in Southfield, Michigan.